Was it a Grisdale Who Walked to London for Justice? When did the Grisdales become Grisdales? Remembrance Day is nearly upon us. I was wondering what I should write. I’ve written many stories about Grisdales who fought, and often died, in the many meaningless wars over the centuries – with, I hope, much respect. My own father served and fought with the Royal Navy in the Mediterranean. Other close relatives lost their lives serving with the RAF. But at least WW2 had some meaning. Finally I decided to write a story about RAF pilot Flight Lieutenant Charles Leslie Grisdale, but not really. I won’t try to reconstruct Charles’s war or his life after the war when he settled down with his family on the Wirral in Cheshire. You will see what I mean. Charles Leslie Grisdale was born n 1911 in Birkenhead, Liverpool. He was the second son of clerk William Walter Grisdale and Sarah Corless. I won’t tell the family history here, though there is much to tell. Without getting Charles’s RAF records, I don’t know exactly when he joined the RAF or what he did in his first few years of service. So let me jump to 1943, by when Charles was a Flight Lieutenant flying Lancaster bombers with 103 Squadron out of RAF Elsham Wolds in Lincolnshire. This was a time when the RAF was undertaking the mass carpet bombing of German cities instigated by Air Marshal ‘Bomber’ Harris. As you can see from the squadron crew list below for August to October 1943, Charles’s crew bombed Mannheim, Nurnberg, Milan, Peenemunde, Berlin, Hannover, Bochum, Hagen and Munich. The attack on Peenemunde was to try to disrupt the production of Wernher von Braun’s V2 rocket. Von Braun of course would later surrender to the Americans, and he and his team of German scientists would go on to put the Americans on the moon. Then on 22 October at 17.58 Charles and his crew, with included a Squadron Leader called Clifford Wood, took off from RAF Elsham Wolds in Lancaster JB276, code PM-F, to join hundreds of other bombers. They never made it back. The target this time was the beautiful medieval city of Kassel. A force of 569 heavy bombers dropped 1,800 tons on the Kassel. This included nearly 0.5 million magnesium incendiary fire sticks designed to ignite fires. Hitting specific targets at night was virtually impossible so the RAF set out to destroy the city and largely succeeded. Damage to the city’s water system made it difficult to fight the fires. Among the civilian casualties were large numbers of wounded soldiers recovering in several hospitals. About 10,000 people were killed. Estimates suggest that about half the city’s population were made homeless. The city of Kassel, in the region of Hesse, in west-central Germany, was subjected to an ongoing bombing campaign that began in early 1942 and went on almost until the end of WWII in 1945. During the heaviest and most intense bombing raid, on the night of 22-23 October 1943, the British Royal Air Force deployed 569 bombers over Kassel’s city centre. The concentrated explosion of 1,800 tons of bombs – incendiaries among them – resulted in a lethal firestorm. At least 10,000 people died in the explosions and ensuing fires, and the flames were still burning seven days later. The city was targeted so vehemently largely because of its important military-industrial sites: the Fieseler aircraft plant, Henschel tank-making facilities, railway works and engine works were all based there. When the Americans liberated Kassel in April 1945, there were only 50,000 inhabitants; in 1939 there had been 236,000. As this report says the ostensible aim of the raid was to attack two important armament factories, but really the aim was to destroy the city by fire. It was an event of almost apocalyptic proportion that visited Kasssel in the Second World War: the carpet bombing of 22 October 1943. At 20.17 the sirens warned the 225,000 people of the town, only a few minutes later the allied air forces attacked. Within one and a half hours the bombers dropped more than 400,000 fire bombs – that amounted to two bombs per square metre in some areas of the old town. The massive firestorm during the night could be seen from 50 kilometres away. It would burn for several days to come. When I lived and worked in Germany I visited Kassel. It is a beautiful and peaceful place, but everything you see is new, even if it looks old! The whole city had to be rebuilt from the ground up after this terrible night. So on Remembrance Day when I fall silent for a minute to remember the victims of two world wars, at the going down of the sun and in the morning, I will remember too the dead citizens of Kassel consumed by fire unleashed from above. For the RAF this raid was one of its most costly. Out of 569 aircraft taking part 48 failed to return, including three Lancasters from 103 Squadron, one of which was Charles Grisdale’s. I don’t know the circumstances surrounding the loss of the Lancaster Charles was flying, it was pretty obviously hit by flak or shot down by a German nigh- fighter; although during this raid the RAF began ‘Operation Corona’ to jam German night-fighter communications. Five members of the crew of Lancaster JB276 were killed: Sqn-Ldr C. S. F. Wood MiD, F/Sgt W. R. Brown, F/Sgt J. F. Craig DFM, Sgt C. Kershaw and Sgt H. R. Wilson. They are buried in the Hanover War Cemetery. Having no doubt bailed out, two members of the crew survived the crash, Flight Lieutenants W. H. Hopkins and Charles Grisdale. They were taken prisoner and soon sent to the POW Camp called Stalag Luft 1. Stalag Luft I consisted of a strip of barren land jutting into the Baltic Sea about 105 miles northwest of Berlin. Two miles south of the main gate a massive Lutheran church marked the northern outskirts of the village of Barth. A large pine forest bordered the west side of the camp and, to the east and north, the waters of Barth Harbour slashed against the shore less than a mile from the barbed wire fence. Enclosing the camp there stretched miles of barbed wire, in two rows four feet apart, attached to 10-foot posts. Every hundred yards, a Guard Tower mounting a machine gun and a pair of spotlights provided constant vigilance and permitted an unobstructed view of all within the confines of the enclosure. The Stalag was divided into five separate areas, called compounds. There were four for prison compounds: South or West, North 1, North 2 and North 3. The fifth area consisted of the German buildings, in the centre, well constructed buildings, green grass, and attractive shrubbery, “The Oasis” as the prisoners called this area, was in sharp contrast to the prison compounds. Barbed Wire! Barbed Wire! Barbed Wire! As though it were a dream. In late April, 1945 as the war in Europe was nearing its end, the Russians were approaching from the east and the British and Americans from the West in a race to get to Hitler’s headquarters in Berlin. Stalag Luft I was north of Berlin, so it was unsure at first which of the Allied fronts would reach them first. As the reports came in and the fighting got closer and closer to Barth, they soon realized that the Russians would be the ones liberating them. They soon began to hear the heavy cannon fire sounds of the Russian artillery getting closer and closer to them. At night the POWs would lay in their darkened barracks and there would be shouts of “Come On Joe” (for Joseph Stalin – the Russian leader) coming from all over the camp. At this time it became apparent to the German Commandant and the guards at Stalag Luft I that the Russians were at their doorstep and they must make a move. So they approached the Senior Allied POW Officer of the camp, Col. Hub Zemke, and told him to prepare his fellow prisoners to march in an effort to escape the approaching Russians. Col. Zemke refused to do so. He informed the Commandant that even though there were over 200 of them with guns, that there were 9,000 POWs and they were prepared to fight rather than march. He told the commandant that he realized this may cause high losses among the POWs but ultimately they would overcome the Germans and with the Russian allies so close he knew this was an acceptable risk. The German command evidently realized that the end of Germany was near and so he accepted this decision by Col. Zemke. The German command then informed Col. Zemke that he and the guards would be leaving the camp at midnight that night (April 30, 1945). Col. Zemke had made plans in case such a scenario arose to take over the camp, as it was evident to him that as Senior Allied Officer he would be responsible for of the safe return of the POWs to Allied control. He had already organized a group of hand selected men which he called the “Field Force” to help him keep the camp in order until they were all safely back in Allied hands. Col. Zemke sent a scouting party out to meet the approaching Russians to inform them that there was a POW camp of Allies located in the area, so the Russians would not be shelling them! Later in the day the Russian commander entered Stalag Luft I and meet with Col. Zemke and the British Senior Officer. The Russian commander did not like the idea of the Allied POWs still being behind barbed wire, so he ordered that Col. Zemke have the fences torn down. Zemke refused at first, but was later convinced (some say by force, with a gun) to tear down the fences. The POWs enthusiastically tore them down. Many POWs then left camp and went into Barth and the surrounding areas. Some of them (approximately 700) took off on their own to make their way to the approaching British lines (my Dad being one of those!). In the ensuing confusion of a war still in progress all around them some of the POWs were accidentally killed. It was the 2nd White Russian Front of the Red Army that entered Barth on May 1, 1945 and liberated the prisoners of war at Stalag Luft I. After the fences were down the Russians then learning of the meagre food supply the POWs had been existing on soon rounded up several hundred cows and herded them into the camp for the hungry POWs to slaughter and eat. This they did immediately. At night they entertained the POWs with their “USO” type variety show that travelled with them. There was much joy and celebration among the newly freed POWs and the Russian soldiers. The Russian Army stayed in Barth for only a couple of weeks. After the POWs were evacuated from Barth, the Soviet Military Administration (SMAD) took over the empty barracks at Stalag Luft I and used them for a repatriation camp for their countrymen that had been used as slave labour by the Germans. Those slave workers that were in the territory occupied by the Western Allies were transferred to the territory occupied by the Soviets. They came into repatriation camps where they were interrogated by the Soviet Secret Service (GPU) and this organization decided whether the former slave workers were sent home to their families or into stalinistic camps (Gulags) to do slave work in coal mines in Siberia or somewhere else. Even some of the newly freed concentration camp survivors which were Soviet citizens were transferred into Gulags because they had been forced to work in the German warfare industry, like in Barth where they were forced to work in the Heinkel plane factory and were imprisoned in the small concentration camp at the territory of the Barth airfield. Actually one British officer described the Soviets as “drunken barbarians”. 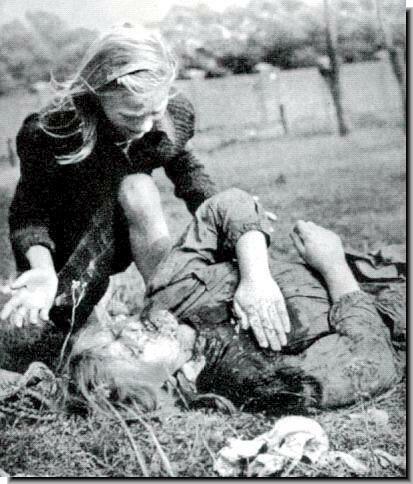 When we think of what the Russian soldiers inflicted on the women of Germany we can well imagine – and shudder. We should remember these women too. But the Russians were of course better disposed to the English-speaking airmen in the POW camps. Yes, I’m a live witness of the events of those days. As I remember today, it was May of 1945 on the coast of the Baltic Sea in Barth. We had a great fraternization with the English and American POWs there. At first time in my life I saw a chocolate bar. It was a big box of chocolate with the sign of the Red Cross and Half-moon. I think that was English or American POWs (I don’t no actually but it was nearly 9000 of POWs in Stalag Luft 1). We exchanged our addresses. One of the POWs (his name was Tobby or Bobby but I don’t remember now) gave me his one, but I lost it – I was very young (at least 19 years old boy). After that all of us – Soviet, American and English – three great nations – sang famous Russian song “Katyusha”. At the end I remember big airliner which took all POWs on its board. It all sounds very amicable, but “the Russians wanted the prisoners transported by land to Odessa, a port on the Black Sea, then by ship to the United Kingdom and then on to the United States, but the idea was rejected and further negotiations followed. Much to the disappointment of almost 9,000 liberated POWs, it took almost two weeks to repatriate the prisoners by air”. And so May 12,13 & 14, 1945 approximately ‘9,000 prisoners of war at Stalag Luft I were flown out of Barth, Germany and back into Allied control. Royal Air Force POWs were flown back to England and the American POWs were flown to Camp Lucky Strike in Le Harve, France, where they were processed and waited for a liberty ship to return to the states’, including Flight Lieutenant Charles Grisdale. Amazingly there is even some film footage of the POWs departing for home, one part of which is below. After Charles arrived back in England he returned to his wife and young children in Wallasey. He had been in some ways lucky. His brother and father were less so. His brother Donald was an RAF Flight Lieutenant and bomber pilot as well, with 254 Squadron. But in February 1945, just weeks before Charles was liberated by the Russians, Donald was killed in action aged just 26. He is buried in Runnymede Memorial Part VII. Charles father’s was a clerk in Wallasey, but during the war he was a Fire Warden and was killed in a bombing raid on Liverpool in 1941. Charles other brother, William Herbert Grisdale, was to die in 1948 in interesting circumstances in Sierra Leone in Africa. But these are other stories for another time. Charles Grisdale died on the Wirral in 1972 aged 61. Lovely piece about Flt Lt Charles Grisdale. I may have a correction to the info about his brother, Donald. The passage below is from the Pollockshields Parish Church Book of Rememberence, which shows he was with 524Sqn (not 254Sqn as stated in the article) which was also a bomber squadron. “Donald Grisdale: Son of William Walter and Sarah Grisdale; husband of Susan Brown Kippen Grisdale, of Pollokshields, Glasgow. An everyday story of Mynd Folk!